If there ever was a time for Chilean students to leave their mark on the country’s educational system, that time is now. Michelle Bachelet came to office on March 11 promising education reform as one of the three central priorities of her government—along with a tax reform that will provide $8.2 billion to pay for the education reform, and a constitutional reform that will purge the last vestiges of dictatorship from Chilean democracy. But student leaders are concerned that the government will use the movement’s dynamic slogans as mere window dressing for cosmetic reforms that do little more than lend legitimacy to the country’s current voucher-based education model. With May’s massive march, and a second march on June 10, they sought to prove that they won’t sit back and watch if the policies proposed by the government don’t live up to their expectations. Chilean students have been seeking substantive education reform since 2006, just months after Michelle Bachelet first took office. Then, in the “Penguin Revolution” named after the white shirts and black jackets of most Chilean high school uniforms, the country’s secondary students organized marches and school occupations to demand free public transportation for students, the elimination of the fee to take the PSU (the Chilean SAT), and high-quality education for all. Bachelet initially tried to suppress the movement, and only when that became politically impossible did she agree to address the students’ concerns. She offered free public transportation to the poorest 20 percent of public school kids, PSU grants for 80 percent of those who took the test and emergency funds to rebuild dilapidated school buildings. She also invited eight high school and eight university students to form part of an eighty-one-member presidential advisory committee on education reform. Despite these gains, Chilean student leaders say she never took serious steps to address the fundamental inequality in the Chilean educational system. That failure is what brought students back onto the streets in 2011 and 2012, when hundreds of thousands of high school and college students marched down the Alameda, occupied their schools and even went on hunger strikes to demand education reform. Those protests forced then-President Sebastián Piñera—whose administration was “ideologically opposed to the student movement’s ideas,” according to Patricia Schaulsohn, a lawyer and education analyst at the think tank Educación 2020—to address the issue of burgeoning student debt: He replaced student bank loans that carried 6 percent interest rates with government loans with only 2 percent interest. Beyond these concrete changes, it’s hard to overestimate the impact the sustained protests have had on Chile’s political system. They’ve placed education at the center of an evolving national discussion about the country’s future. Thus, in the November 2013 elections, all nine presidential candidates included education reform in their platforms. Also, four former student leaders, who had once led marches down the Alameda, were elected to the Chilean Congress. Camila Vallejo, one of these former leaders and current MPs, said in her acceptance speech that Chilean conservative parties are “in the ICU” because of the progressive resurgence brought about by the student movement. And President Michelle Bachelet came to office promising to do what she didn’t during her first administration: overhaul Chile’s educational system, from its universities all the way down to its preschools. The Chilean educational system has three fundamental flaws. First, from preschool on, it’s extremely segregated by social class: rich kids go to school with rich kids, and poor kids with poor kids. In 1981, Pinochet’s dictatorship instituted a voucher system to fund primary and secondary education, with the government giving every public school, and every subsidized private school, a set monthly payment for each of its enrolled students. In theory, this means that schools have to improve in order to attract students and that students are free to choose the best possible school. But, in practice, Chile’s poorest students go to public schools (41.2 percent of schools), which charge no tuition fees; middle-class students go to subsidized private schools (48 percent of schools), which charge parents an additional $20 to $160 per month beyond what the state gives them; and the children of Chile’s elite go either to private schools (10.8 percent of schools) or to the country’s highly-selective public schools, which have demanding entrance exams. The second fundamental flaw in Chile’s education system is the huge gap between how well the children of wealthy families and those of poor families perform on standardized tests like the PISA. And, third, getting a college education is extremely expensive, and those who drop out (in some majors, upwards of 40 percent of those who enroll) as well as those who attend less prestigious schools are unlikely to earn the income necessary to pay off their student debt. If Chile’s problems sound uncomfortably familiar, there’s a reason for that, says José Joaquín Brunner, a professor at the Diego Portales University and the director of the UNESCO Faculty of Comparative Higher Education Policies. If any country has the same problems plaguing its schools as Chile—and can learn the most from the solutions being proposed by Chilean activists—it’s the United States. The best way to improve the quality of Chilean education would be to start by reducing the system’s overall inequality, says Brunner, in imitation of Southeast Asian and northern European education models. Thus, “the central objective [of any educational reform] is to create a system that compensates for socioeconomic and cultural inequalities that start in infancy,” says Brunner. To do that, in Chile as in the United States, the government needs to construct more preschools for poor children and to improve the quality of existing preschools, because it’s in early education that “the battle is won or lost,” says Schaulsohn. Michelle Bachelet’s got this covered—on paper, at least. Her policy platform (an almost 200-page document published during her campaign outlining her goals) includes a plan to construct 4,500 new daycare centers and 1,200 new preschools over the next four years and to improve teacher training and school accreditation at the preschool level. 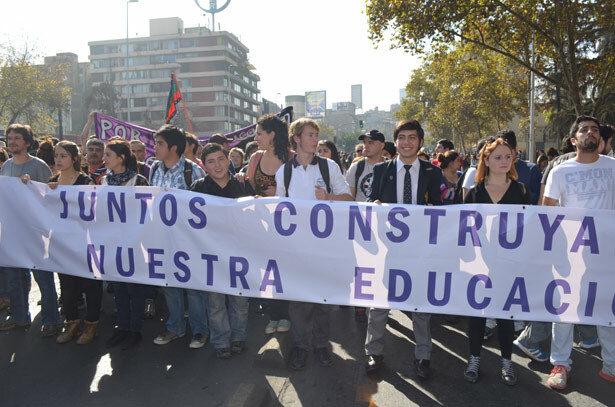 In fact, Chileans across the political spectrum, including student leaders, agree that the government needs to improve the country’s preschools, that the country needs better teacher training and teacher salaries, and that public schools should be run by school boards (similar to those in the United States) rather than, as they currently are, by mayors. That’s where the consensus ends and the debate begins. The primary controversy revolves around who should pay for education: the state, or individuals. The student movement has always maintained that education is not an economic good but rather a fundamental right, and that it should therefore be financed by the government. For Chileans brought up after Pinochet’s ouster in 1990, doing so would be one more way of ridding the country of the dictatorship’s neoliberal legacy. 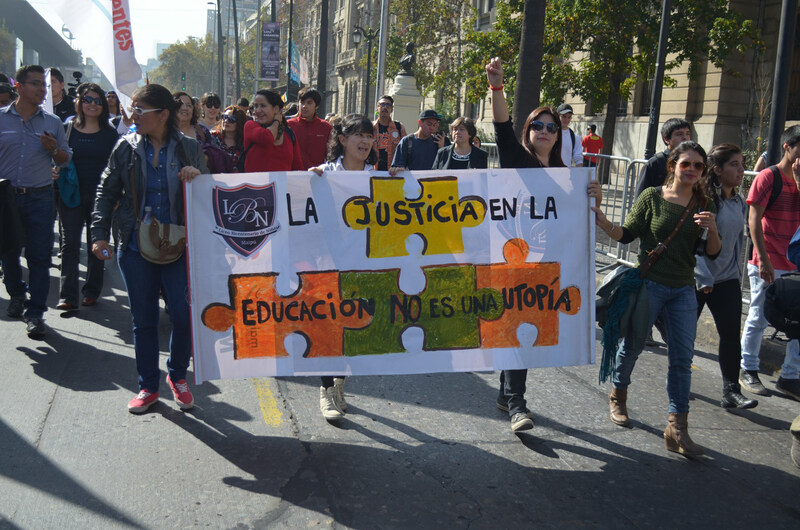 Bachelet’s policy platform appears to support the students’ vision. But it’s unclear if it’s possible for the Chilean state to fully fund the country’s educational system, even with the $8.2 billion that the tax reform will theoretically bring in. “In terms of equity, it would be the worst solution,” he concludes. Instead, Brunner says, the government should continue charging tuition, even in state-owned universities, to those who can pay, and it should extend scholarships that cover everything from tuition to books and public transportation to all those who cannot pay. Gabriel Boric, a former student leader and current MP, counters that, “given Chile’s current conditions, we’re able to have a model of development that includes the whole population and that doesn’t segregate according to class, which is what commercializing education produces.” To pay for an education reform of this magnitude, he recommends an even deeper tax structure reform than the one proposed by Bachelet: a reform that shifts from reliance on sales taxes to reliance on both a progressive income tax as well as royalties paid by the copper mining companies that operate in Chile. On May 19, Education Minister Nicolás Eyzaguirre introduced a bill that would eliminate tuition fees in schools that receive money from the state and put an end to entrance exams at the country’s most prestigious public high schools. The bill was quickly attacked from all sides. On the left of the political spectrum, student leader Melissa Sepúlveda says it fails to replace the voucher system with direct school financing and thereby continues to treat education as a good, not a right. Vouchers also make it harder for the state to supervise schools’ use of funds, she says. On the right, Sylvia Eyzaguirre, of the think tank Center for Public Studies, argues that ending family tuition payments will be too expensive. Since almost 90 percent of Chile’s 12,500 primary and secondary schools are either public or subsidized, giving each of them $160 more for every student every month would cost $5.5 billion a year—that is, more than half of the $8.2 billion that Bachelet’s tax reform is expected to raise. And, at the National Institute and the Barros Arana National Boarding School, two of Chile’s most prestigious public high schools, the students occupied their schools and refused to allow classes or administrative activities in order to protest the elimination of entrance exams. The police evicted the students from the National Institute on June 13, after a three-week occupation. Only after passing these reforms does the government plan to work on reforming higher education, and Bachelet’s policy platform offers only the barest outline of her plans. She promises to “make progress toward universal free education” by extending state scholarships to students from the poorest 70 percent of Chilean families. (Currently, those from the 60 percent poorest families receive state scholarships.) And she plans to introduce a requirement that, in state-funded universities, at least 20 percent of the students in each major must be from the 40 percent poorest families. Student leaders have been meeting with teachers, professors, university presidents and education experts in order to write an alternative series of reforms to those proposed by the government. The students’ efforts will be directed toward the primary demand that Bachelet has not promised to deliver during her time in office: free, universal higher education. If Chile, over the next four years, manages to improve its preschools, decrease inequality in its educational system and figure out how to fund higher education for its poorest citizens, the United States should take heed. But, beyond concrete reforms, MP Boric says the biggest lesson for students in the US is the importance of taking to the streets to demand change.